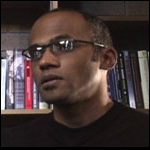 Martin Summers, Associate Professor of African and African American Studies at Boston College, received his Ph.D. in U.S. History from Rutgers University in 1997. He taught at the University of Oregon and the University of Texas before moving to Boston College. Professor Summers teachers courses in African American history as well as the history of gender, race and sexuality in the U.S. His publications include Manliness and Its Discontents: The Black Middle Class and the Transformation of Masculinity, 1900-1930 (Chapel Hill: University of North Carolina Press, 2004), “Diasporic Brotherhood: Freemasonry and the Transnational Production of Black Middle Class Masculinity,” in Gender and History (November 2003); and “’This Immoral Practice’: The Prehistory of Homophobia in Black Nationalist Thought,” in Toni Lester, ed., Gender Nonconformity, Race, and Sexuality (Madison: University of Wisconsin Press, 2002). Summers is currently researching race and mental illness in the nineteenth and twentieth-century U.S.